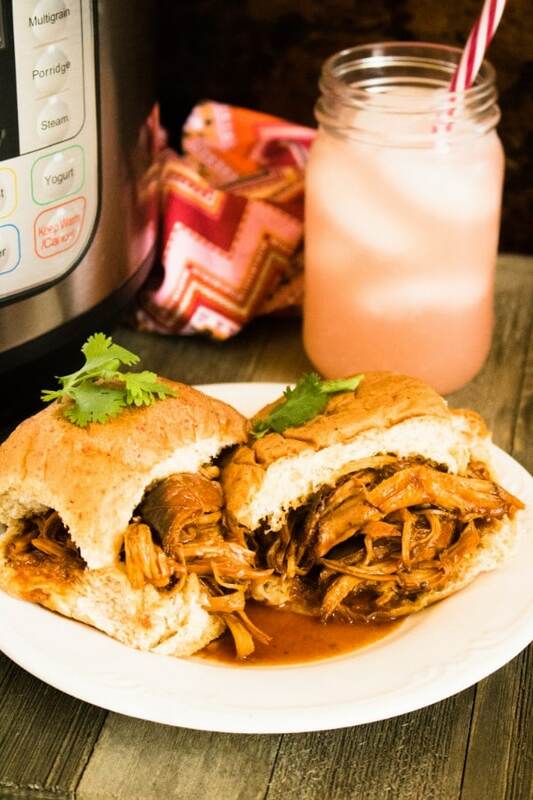 Instant Pot BBQ Shredded Chicken is a super easy recipe, perfect for beginners and a go-to when your grocery store trip is overdue. 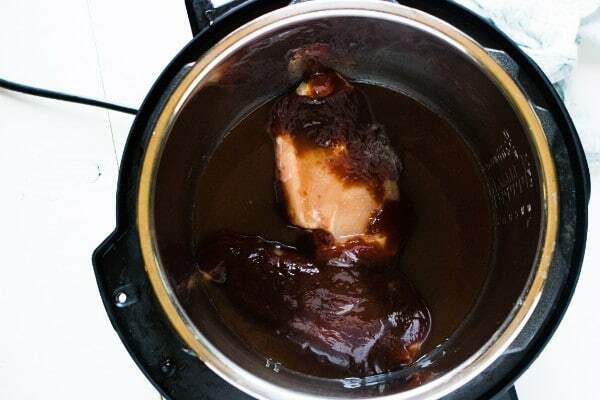 This is also one of my favorite Instant Pot chicken recipes for feeding a crowd. The Instant Pot can be intimidating when you first get one. It works differently than most of your other cooking appliances and it has a bunch of buttons. It’s super helpful to score a win early so that you get the full benefit of your Instant Pot. The more ingredients a recipe has, the harder it is to guarantee consistent results. 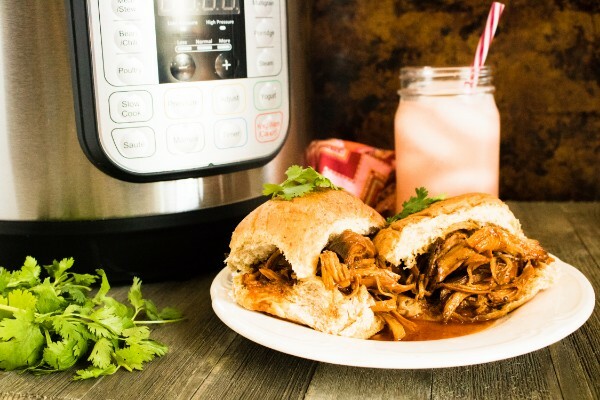 I wanted to share a surefire, uncomplicated Instant Pot recipe to help IP users achieve an early success. Not only is it perfect for beginners, it’s a great way to feed a crowd since you’re only limited by the size of your Instant Pot. 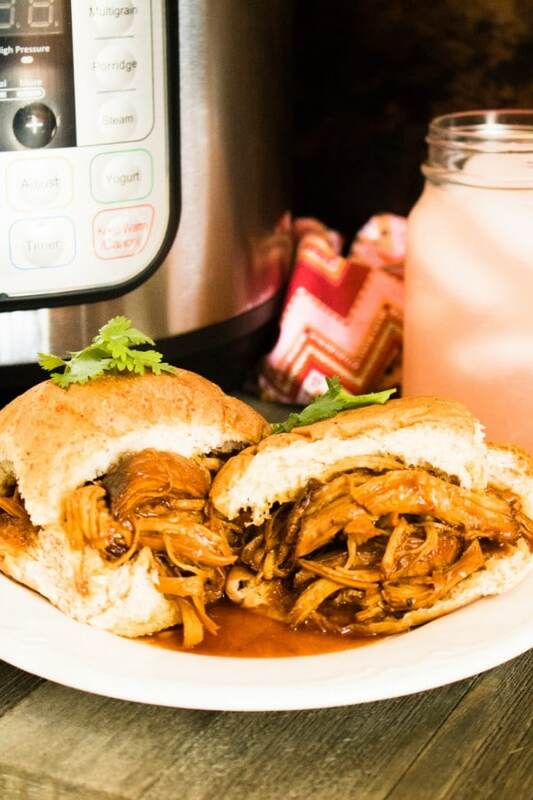 This Instant Pot BBQ Shredded Chicken is one of the easiest things you’ll ever make in your Instant Pot. Just three ingredients and you just have to dump everything in and set the time! You’ll need four chicken breasts, a bottle of your favorite BBQ sauce, and some water to help the pot come to pressure. Pour everything into the pot. Secure the lid on your pot and make sure the valve is set to sealing. Then, press “Manual” or “Pressure” (depending on your Instant Pot model). Set the time for 15 minutes. Let the pressure release naturally, then carefully remove the lid and shred the chicken with two forks or a mixer. Serve on buns. For sides, I really like coleslaw and baked beans. When I want to do something even easier, I serve these BBQ chicken sandwiches with potato chips and carrot or celery sticks. Here is the recipe card with the exact measurements and detailed instructions so you can make your own Instant Pot BBQ Shredded Chicken. Set the Instant Pot to manual 15 minutes high pressure, and then allow for a natural release to retain optimal moisture. Remove the lid from the pressure cooker and use two forks to shred the chicken. 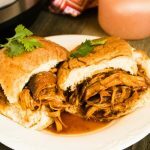 If you’re new to your Instant Pot, I hope this Instant Pot BBQ Shredded Chicken recipe has put you at ease. Check out my Instant Pot tips and resources for more helpful information! Can you do this with frozen chicken breasts? Yes! Just make sure the breasts aren’t stuck together when you add them to your Instant Pot. The pot will take longer to come to pressure so be prepared for a longer wait. Also, frozen breasts release extra liquid so the sauce will be runnier. You may need to add extra BBQ sauce or a little tomato paste to thicken it up. Don’t reduce the amount of water called for in the recipe though because you’ll need that liquid to create pressure. I tried this recipe for the first time today. It looked simple enough. Everything turned out delish. I did find the sauce to be watery. I prefer a thicker sauce. This is a good base from which I will tweak to my liking. Thank you! Thanks for your feedback Martha! Thx for sharing your recipes. I am a new IP user, and I love the easy recipes. I made chicken enchiladas and they were delicious.